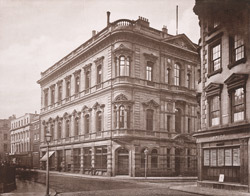 "The Conservative Club, which occupies a prominent position at the corner of Cross-street and St. Ann's-street, was opened on October 26, 1876, when the old club in St. James's-square, now known as the 'Junior Conservative,' was vacated. The club was built from the joint designs of Mr. Robert Walker, of London, and Messrs. Horton and Bridgford, of Manchester, the style of architecture being Italian. It has a frontage towards Cross-street of 106 feet, and in St. Ann's-street of 68 feet, the angle formed by the junction of the two streets being marked by an oriel carried up through the first and second floors...The principal apartment is the dining-room...There are, in additon, reading, writing, and spacious billiard and smoke-rooms, each remarkable for the luxurious character of the fittings, as well as for the taste displayed in the decoration."